Dashboard summarizes you diary. It connects your diet log with your weight loss plan while providing analysis and advice on your diet. Tap anywhere for details and insights, you will be delighted. 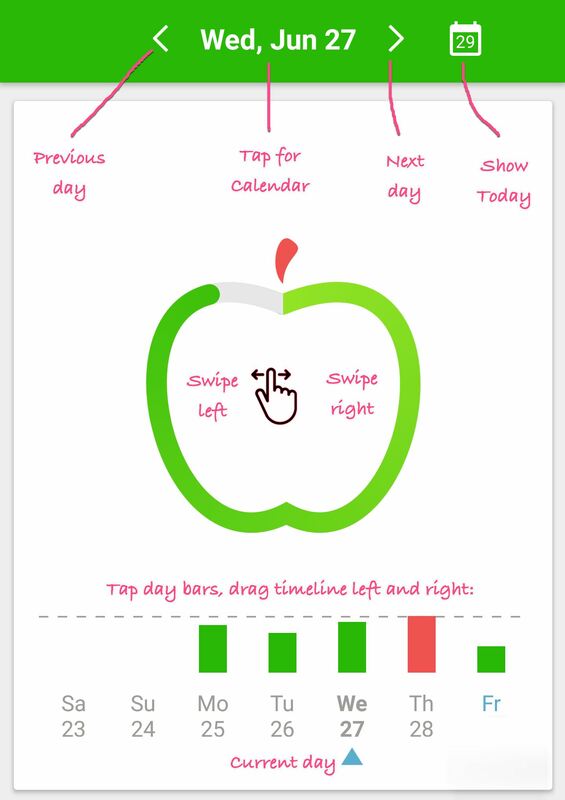 Your Dashboard becomes more elaborate as you start tracking your diet and tuning your plan. Tap three dots ⋮ buttons to get to the details and customize dashboard parts. Open any part of your diary with sandwich button ☰ located at the top-left corner. Notice that you can use MyNetDiary for planning your day by logging foods in advance, then tracking your actual food consumption. You can track Blood Glucose and insulin on the dashboard: go to Settings screen and turn BG & Diabetes Tracking ON. If you want to see metric units or kilojoules, turn them on at Settings screen. Check App Guide and review your personalized My Advice sections accessible via sandwich button ☰ always located at the top-left corner. Be sure to read on Finding Foods - the most important MyNetDiary skill.